Paul Kemp is an American journalist who is struggling to find his voice. When he takes a job in beautiful sunny Puerto Rico he hopes that his life will turn around. He finds himself drinking heavily, writing horoscopes and trying to build himself a life. It all turns around when he meets Hal Sanderson and his beautiful girlfriend Chenault with whom he feels an instant connection. Kemp struggles to maintain his professional and social life, all the while trying to find his own voice. 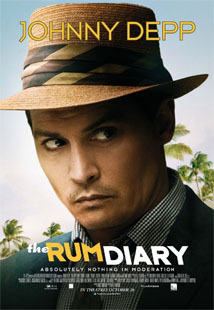 The Rum Diary is a well-written, well-balanced movie based on the novel by Hunter S. Thompson. Thompson applied for a job at the real San Juan Star, just like the one portrayed in the film. He made friends with the writers on staff and then wrote the novel based around them. This provided good source material for a film that deals a lot with substance abuse. Kemp is an alcoholic who is in denial, and finds himself dealing with the struggles of maintaining a normal life. The ’60s atmosphere is captured; the unabashed lifestyle is well defined by the public drinking and the ability to light up a cigarette anywhere anyone choses. The lifestyle came alive through the eccentricity of the characters. Lead by the talented Johnny Depp, the cast does a marvellous job of giving breath to an era that has been overdone in films. Amber Heard is very sensual in her portrayal of Chenault, a natural beauty who catches the eye of every man as she enters the bar. This includes the charismatic Kemp, but their relationship is forbidden as she is dating Sanderson. A tension builds between Kemp and Chenault, an undeniable connection was immediately established and it builds throughout the film. The cast may have been the central factor in driving the feel of the era, but another big factor played an important role. Many of the works of fiction directly mirror the career of Thompson. Of course the trouble and the absurdities Paul and his friends find themselves a part of may have been a bit over dramatized or over exaggerated, but the material and the realism was already there. With the sun-soaked atmosphere of Puerto Rico at the ready, The Rum Diary takes a step beyond just being a dramatic story. There are scenes of crude behaviour and excessive drug and alcohol use. However, it is mild in comparison to Fear and Loathing in Las Vegas, but director Bruce Robinson still has the willingness to show it. The movie is broken down into three acts: The introduction, Paul Kemp is first introduced to the island. The second act, where he rises among the ranks of local well-known men. And the third act, when his lifestyle and choices have real world consequences and he is forced to decide what is next. The Rum Diary is well done, with all essentials present. Depp has successfully portrayed another work of Thompson with ease and efficiency. But use discretion when deciding whether to go, The drug use is excessive.